The Life Blood of our community is what you all represent. Thank you for being a part of what makes us Continue to be a family! Well deserved Promotions! No Promotions in Nova Company this month. No Promotions in Whiskey Company this month. No Promotions in Zulu Company this month. Your continued Loyalty and dedication is a key to our success. Thank you for all you do. Join us for Drunken Battle Friday - gaming, prizes and good times! ANTHEM @ 9:00PM EST - This week India will be playing Anthem! Post up some screenshots of the mayhem in the link below as well as to enter the India raffle. RS6 @ 9:00PM EST - This week Vanguard will be playing RS6! Stop by link below to join the conversation and to enter the Vanguard raffle. RETURN OF ZULU DBF @ 8:00PM EST - The engines are tuned, guns ready for action - Zulu DBF is back! Join in on what they have in store this DBF! Philly46 graciously donated his prize last leek so we are doing a double prize draw this week! Each winner will receive 100 OTC! You can only win one time and I will be matching numbers in order you post them and matching those in order, to the random numbers I generate. 7 DAYS TO DIE @ 9:00PM EST - This week India will be playing 7 Days to Die! Stop by link below to join the conversation and to enter the India raffle. APEX LEGENDS @ 9:00PM EST - This week Shadow Co. will be playing on Apex Legends, post those wins! Stop by link below to join the conversation and to enter the Shadow raffle. SPACE ENGINEERS @ 9:00PM EST - This week India will be playing Space Engineers, check out what's happening in space this week!. Stop by link below to join the conversation and to enter the India raffle. CANTED IRON SIGHTS @ 9:00PM EST - This week Shadow Co. will see how many dinners they can earn with canted iron sights!. Stop by link below to join the conversation and to enter the Shadow raffle. THE DIVISION 2 BETA @ 9:00PM EST - This week Vanguard will be playing Tom Clancy's The Division 2, see what DC has to offer in the sequel! Stop by link below to join the conversation and to enter the Vanguard raffle. 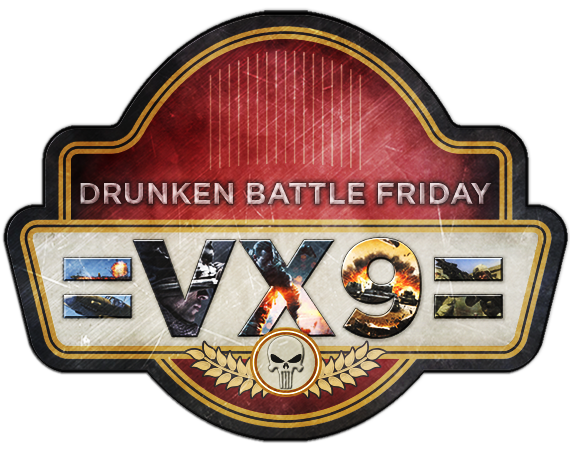 Join us for Drunken Battle Friday for DBF! SPACE ENGINEERS @ 9:00PM EST - This week India will be playing Space Engineers, a ship build and PvP battle are on tap if enough people attend!. Stop by link below to join the conversation and to enter the India raffle. The Divsion @ 9:00PM EST - This week Vanguard will be playing Tom Clancy's The Division. Join in for some fun! Stop by link below to join the conversation and to enter the India raffle.